“Not everything that counts,” said Einstein, “can be counted.” But in the study of animal cruelty and its effects, surprisingly, now there is something important that we can count: the financial costs that cruelty imposes on society. That is to say, besides the heavy physical and emotional toll that the day-to-day abuse of farmed animals causes the animals themselves, these practices impose significant, measurable economic costs on people as well. We can calculate these costs using what economists call “willingness to pay.” Add up what everyone in the United States is willing to pay to end cruelty to farmed animals, and that’s the total cost that cruelty imposes on American society. An economist would call this an “externalized” cost of animal cruelty. Externalized costs are expenses of production that producers impose on society rather than paying. For example, if I dump my garbage in the local park at midnight instead of putting it in a trash can at the curb, I’ve externalized my garbage collection costs on society instead of internalizing them. There are a variety of ways to estimate cruelty’s costs, but there’s one way of doing it that makes particular sense. In their recent book Compassion by the Pound, economists Jayson Lusk and F. Bailey Norwood calculate the externalized costs imposed on compassionate consumers by cruel factory farming practices. Lusk and Norwood use an interesting technique for measuring cruelty’s costs: they conduct live auctions with real people who used real money to bid on alleviating particularly cruel factory farming practices for a particular group of animals. In their study, people actually paid an average of $57 in hard dollars per person to move 1,000 laying hens from battery cages to free-range systems, and they paid $23 per person to move 1,000 sows and their offspring from gestation crates to shelter-pasture systems. Extrapolating from these results, Lusk and Norwood estimate that people would actually pay an average of $342 and $345 per person, respectively, to implement these welfare changes on a national basis. 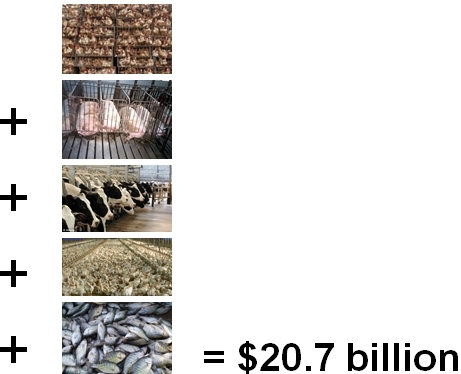 Using these figures as a base, we can extrapolate further to estimate how much Americans would pay to end three more factory practices that are particularly cruel: zero grazing for dairy cows, rapid growth and hyperconfinement for broiler chickens, and overstocking and inhumane slaughter of farmed fish. Take $343.31, the midpoint of the range between the two figures Norwood and Lusk estimated people would pay to improve hen’s and pig’s lives, and apply it to all the hypothetical changes. The total that this exercise suggests each American would pay, on average, to make all five of these changes is $1,717.27. Adjusting this figure for inflation, multiplying by the number of US adults, then amortizing the total over twenty years (the standard IRS depreciation period for farm buildings) yields a total of roughly $20.7 billion yearly that farm animal cruelty imposes on Americans in externalized costs. While this cruelty number might seem high, it is actually on the low side. For starters, the estimate of $20.7 billion yearly covers only five inhumane practices. It doesn’t include numerous others, like raising veal calves in crates, force-feeding ducks to produce foie gras, castrating pigs and cattle without anesthetic, and killing male chicks by starvation, suffocation, or grinding. Adding these and other practices to the calculation might double or triple the total. This number also doesn’t cover the financial costs to the animals themselves. Economists don’t recognize non-human costs, but perhaps they should. After all, it’s not hard to measure animals’ willingness to pay for better living conditions, and doing so would give us an understanding of cruelty’s economic costs to the animals themselves. In one study, for example, researchers measured pigs’ willingness to pay for food and companionship by having them press a nose-plate to either eat or hang out with friends (they chose food by a factor of two to one). Would Americans really pay almost $2,000 each to end factory farming’s cruelest practices? Moreover, could we? Of course, not everyone could or would. But this figure is just an average, and while some would pay less (or nothing), some would pay much, much more. Assuming that $20.7 billion is a reasonable estimate of the cost of cruelty, how does knowing this number help us? In other words, what is it good for? One way this number is useful is to counter arguments about the value of the meat and dairy industries to society – particularly when the cruelty figure is added to the other $394 billion in externalized costs of animal food production. It turns out that for every $1 of animal food sold at retail, the industry imposes almost $2 in externalized costs on society. Perhaps the animal food sector is not as good for the American economy as producers would have us believe. Another way this figure is useful is to put cruelty’s true costs in perspective. $20.7 billion is enough to run Iceland’s government for four years. It’s eight times the combined annual profits of Tyson and Cargill, two of the world’s biggest animal food producers. In short, it’s a massive number, and while it can’t adequately convey the suffering that billions of farmed animals endure each year, it does help us understand – and measure – how this suffering affects people. F. Bailey Norwood and Jayson L. Lusk, Compassion by the Pound: The Economics of Farm Animal Welfare (New York: Oxford University Press, 2011). L. R. Mathews and J. Ladewig, “Environmental Requirements of Pigs Measured by Behavioral Demand Functions,” Animal Behavior 47, no. 3 (1994): 713–19.